Local pilots enjoyed an extended weekend of paragliding excitement leading up to a breezy Labor Day, complete with squall dodging, goalposting, face planting, sand rolling, sign waving, barbecuing, tandem sharing, greenwall exploring, first-time flying, top landing and ridge hopping, not to mention a whole lot of cooler depleting and general celebrating. 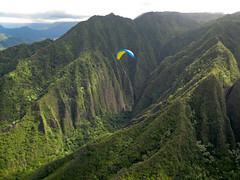 On Friday, Jim, Don, Scot and I flew several crazy flights between and during the numerous squalls blowing into Kahana, while Jeff and Frank evaded the showers drifting into Makapuu. The Kahana conditions were shifty and light, and often quite northerly. After coring what I swear was a lee-side thermal in dead wind straight up from the north ridge, I encountered nothing up high but turbulence and sink, and I soon headed into the LZ to show off a new and scary variation on my famous two-tree landing: I snagged a high branch on the tall dead tree that leans over the LZ as I tried to correct an ill-conceived approach in an unexpected tailwind. But as it spun me slowly around, somehow I was able to pull free of the high branch and mush the wing down to a pretty hard landing on the beach below, only to see it snag on the much lower branch of a live tree as I pounded in next to Yolie, who met my sheepish smile with an expression of barely relieved horror. Jim tried to raise the ante with a face plant landing in the keyhole, but then Scot took the prize by sending the sand flying during his dramatic high-speed downwind roll at the surf's edge. After all that excitement, we ran off to help Q with some signwaving. 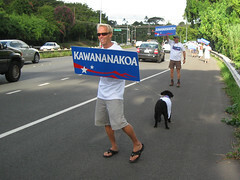 Reaper, Ginny, Dave, Ken, Don, Yolie, Frank, Linda, Jetflap, Jim, Steve, Berndt, Rich, and I joined Q and Roger for a squall-saoked two hours of signwaving on the Pali highway. Q said it was the largest signwaving event they've had to date. Not only that, but signwaving in the rain is apparently worth more votes than dry signwaving. Afterwards we retreated to Lanikai park for a party and BBQ at the mobile HQ trailer, where we met John and Leslie. Thanks to everyone who took the time to come out and support Q in his campaign efforts. You guys rock. 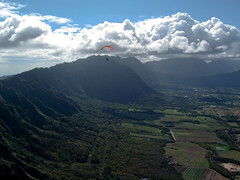 On Saturday, a bunch of folks flew Makapuu starting early in the morning. Jim, Jeff, Steve, Scrappy, and Dave (on a tandem) flew the first session. After lunch at Kona Brewing Company, the second session got underway: Reaper flew tandem with "Jefe" Ray, joined by Jeff, Jim and Dave for second flights, and Jared and I flew as well. Jeff and Jared ventured down towards Puu O Kona for the first time in the nice northerly conditions, and Dave made it as far as the reservoir along Greenwalls before turning back. Marc and Sharky were also on hand to help us celebrate a great day of flying. On Sunday, we saw another big day at Kahana: first Kahana flights for new pilots Marc and "Jefe" Ray, plus great flying for veterans Jim and Ginny and Reaper. Hillbilly toplanded to borrow a radio and joined me above Puu Piei, from where we hatched a plan to hop the ridges downrange and land in front of the beach-going crowds at Pounders. After Jim graciously retrieved us, we found Rich in the air enjoying a lonely but sweet flight, coming in to land moments before a line of squalls arrived to shut down the long day's party. We heard later that Fireman also had a lonely flight, out at Makapuu. 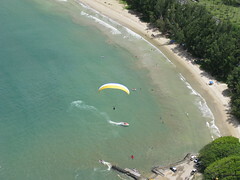 On Labor Day Monday, Jim and Jeff camped out on low launch at Kahana, waiting in vain for the stiff breeze to abate, before throwing in the towel and heading home. Reaper called for a sandbar party - and I bet there was some kite-surfing happening today too. Maybe even some low in the bowl flying at Makapuu? If anyone else has good stories or pictures to share from this weekend, please post them here.